The spring is the favourite season for many of us, and Casumo just made it slightly better. To celebrate the fresh summer vibes, the premier UK casino is hosting a massive promotion where a total of £100,000 will be handed out from now until 2nd of June. Play at Casumo for a chance of winning £5,000 every day! Summer is in the air, and it’s time to start planning your vacation. When you play at Casumo during the new spring promotion, you get a chance of winning £5,000 cash every single day. That would probably go a long way to fund your dream holiday! For a shot at the daily jackpot, you just need to make a deposit at Casumo. When you deposit £25 or more at Casumo, you will get an entry into the daily raffle. You can join the draw every day during the promotion, but you can only get one entry per day - which means that every participant has an equal winning chance. The draw happens at midnight, and one lucky player will take down the daily pot of £5,000. The prize of the daily draw is £5,000 in real, wager free cash, added straight to the winner’s Casumo account. Just make a deposit of at least £25, and your name will be added to the raffle. The promotion lasts until 2nd of June, so start playing already today for a chance of winning! 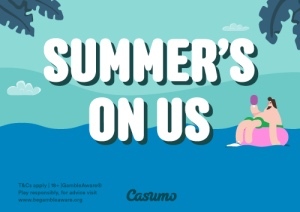 Read more about the promo by visiting Casumo. If you deposit in order to secure yourself an entry into the daily raffles, why not use the funds to try your luck in the popular Reel Races? Big prizes are up for grabs in the special races of the week, as the winners will leave with £2,000 in pure cash. Join the races by playing the new Play’n GO game Legacy of Egypt at Thursday, Friday and Saturday 20:00 CET. Find the treasures of ancient Egypt in the bonus game, where your wins are multiplied! As always, there’s a series of exciting races running on Sunday as well - this week, you can battle it out in great slots such as Lucky Links and Deco Diamonds. Visit Casumo to read more how Reel Races work, and prepare to try your luck against the other players!